The Hillsborough County Sheriff’s Office said that the recent incidents of stealing high value merchandise in a grab-and-run fashion are not a new trend. But, with the holiday season just around the corner, an increase of awareness on the part of residents and businesses is a good start in order to avoid becoming the next victim. “We are not seeing a trend, just an increase of the way we are alerting the community and ask residents to identify the suspects, thanks to better surveillance, photos and video,” said HCSO Public Information Officer Larry McKinnon. Giving testimony to the importance of being on alert is the most recently reported number of multiple incidents that have occurred at the Westfield Mall at the Brandon Town Center prompting the Sheriff’s office to seek resident’s assistance in identifying the suspects. The first of three recent cases involve two suspects stealing more than $4,200 worth of purses from the Dillard’s department store. According to deputies, two black female suspects entered the store, selected 18 Michael Kors purses from a display and fled the store without paying for them. The video surveillance shows the suspects first surveying the store and then quickly grabbing the bags and running out with the items. 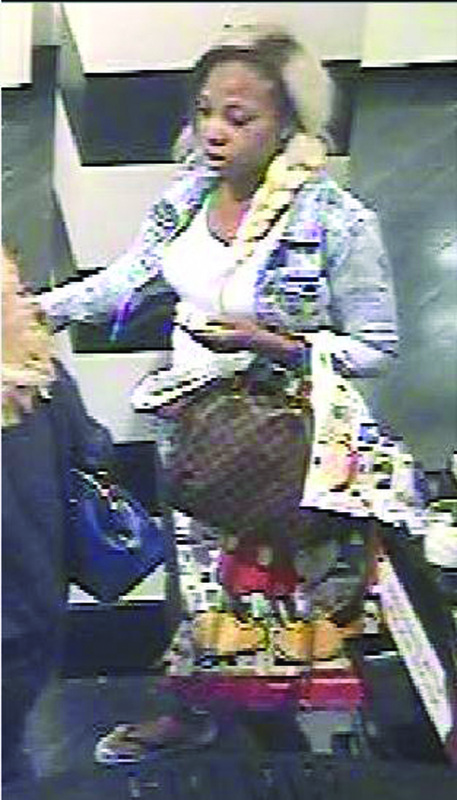 In a similar fashion, two suspects entered the Sephora cosmetics store also located at the Westfield Shopping Town Center Mall, and after hiding six bottles of perfume in the bags they were carrying, fled the store without paying for the items that valued more than $500. Just days prior to the perfume snatching, a suspect stole an $8,000 gold chain, from Zales also located at the Brandon Mall. According to deputies a white male suspect entered Zales, and after he requested to view the 14 karat gold chain, grabbed the chain and ran out of the store. Anyone with any information reference the suspects is asked to call the Hillsborough County Sheriff’s Office at 247-8200 or anyone with any information regarding the identity and whereabouts of these suspect and who wants to be eligible for a cash reward is asked to call Crime Stoppers at 1-800-873-TIPS (8477), report anonymously online at www.crimestopperstb.com or text “CSTB plus your tip” to C-R-I-M-E-S (274637). A total of 52 HCSO deputies and Florida Department of Correction’s probation officers fanned out across Hillsborough County last month to insure that identified sexual predators were not participating in Halloween activities involving children. The efforts, in which deputies worked to make contact with offenders who are restricted from having contact with children and remind them of their prohibitions, resulted in five arrests. The operation also included undercover surveillance for any criminal activity and the monitoring of pedestrian cross walks and roadways with the goal to prevent pedestrian injuries and identifying traffic violators. “Working together we can help make this year’s Halloween season safe for everyone,” Sheriff David Gee said prior to the operation. Upon completion, Gee said that Operation Safe Treats, which falls in line with his priority of eliminating gangs, preventing violent crimes and most importantly the safety of children, went well. “We want our kids to enjoy the holidays have a great time but be safe,” Gee said.